Why Choose Maco For Package Manufacturing? We have a large variety of package manufacturing equipment and Form Fill Seal (FFS) packing installations. Our 240,000 square foot facility is fully equipped to handle any size product and order that needs packaging manufactured in a timely manner. We have the capability to receive bulk shipments of cereal, snack food, dried fruit or powders and utilize horizontal pouch forming, filling, and sealing equipment to create a variety of pouch styles, shapes and sizes. Optimize your product’s packaging production by manufacturing die cut sheets with Maco. Our die cutting capabilities range from small 1″ x 1″ production parts to 60″ x 60″ roll end covers. All conventional flexible packaging materials can be die cut. This will allow for quicker production of your packaging, less waste of materials, and precision during the manufacturing process. If a square bag just does not meet your needs, Maco PKG is confident a Contour Shape Bag will. Maco PKG can design and manufacture an irregular seal and outside cut to meet any unique shape. Eliminate the difficulty of trying to fit your product to traditional size packaging. Our custom-made contour manufacturing capability offers you easier production and allows you to maintain the unique look of your product. Materials can be ordered with a variety of printing options. Multi-color mono web surface or reverse print laminations are available. If you need your brand to shine or be presented in a formal fashion, we can offer you multiple options for printing. When you choose Maco PKG as your package manufacturing company, you’re choosing a gamut of cost-effective options. 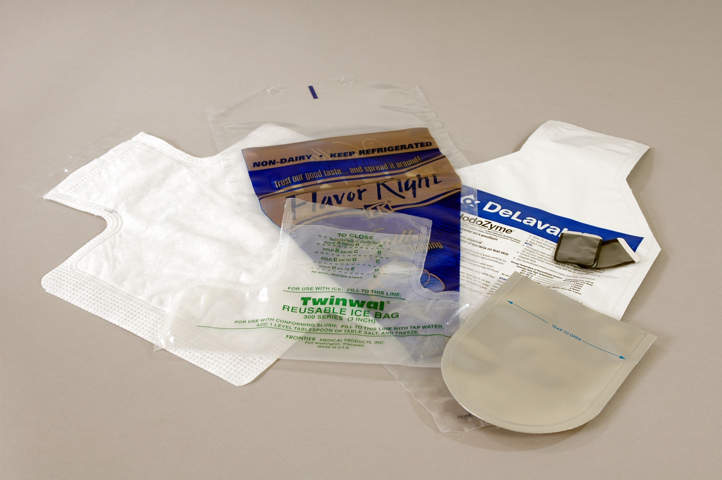 Maco Bag provides custom solutions to challenging customer requirements.